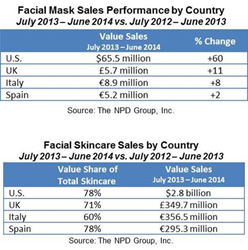 The NPD Group, Inc., a global information company, reports that sales of prestige facial skincare masks grew in the U.S., UK, Italy, and Spain during the 12 months ending June 2014. This growth helped to drive 2 percent value increases for overall facial skincare sales in both the U.S. and UK, and offset the segment declines in Italy and Spain. “The skincare industry has an opportunity to continue to grow and evolve with this, and other budding categories, through innovative product offerings and messaging,” said Karen Grant, vice president and senior global industry analyst, The NPD Group, Inc. The segment is still relatively small in size, but masks have had a significant impact on the overall sales of the prestige facial skincare category for the past 12 months, particularly in the U.S. Facial masks significantly outperformed much larger segments, like facial moisturizers. Facial skincare accounts for the majority of total prestige skincare sales in the U.S. and Europe, and plays a strong role in the direction of the overall category. American and European consumers are increasingly interested in facial skincare with a variety of benefits in addition to anti-aging. Spain has embraced facial masks, and products with benefits targeting eyes and lips. Consumers in the U.S., UK, and Italy are also placing an increased emphasis on the face. In addition to anti-aging, sales of products targeting cleansing, hydration, anti-acne, and toning for the face have increased compared to the 12 months ending June 2013. *Prestige Skincare: Products sold mainly in U.S. Department Stores.